Armenian mystic G.I. 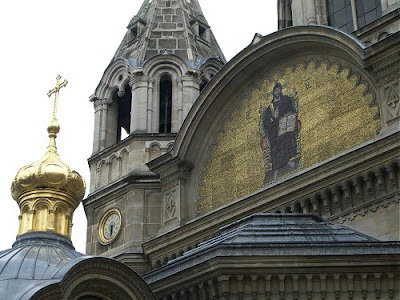 Gurdjieff's funeral was held in La cathédrale Saint Alexander Nevsky in Paris, which is seen in my photos. The cathedral choir is famous for its tradition of Russian Orthodox chant. In 1967, under their director Evgeni Ivanovitz Evetz, the choir recorded the superb anthology of Russian Orthodox music that featured On An Overgrown Path three years ago. Possibly the best record of 2009 in the free jazz genre. Anyway I listened to it a 15 times. it just keeps hounting my mind. Barry Guy & Mats Gustafsson : “ Sinners rather than Saints”. Edited on just 500 vinyl LPs. for info, this church is on the same block as Paris's Salle Pleyel. Thanks Antoine. 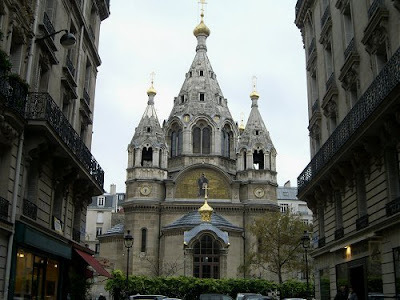 La cathédrale Saint Alexander Nevsky is also fairly close to the Salle Wagram, which has been the venue for many great recordings, including some of Georges Cziffra's Chopin albums for EMI Pathé that I bought for a song in Paris.